How Does a Shower Balancing Spool Work? 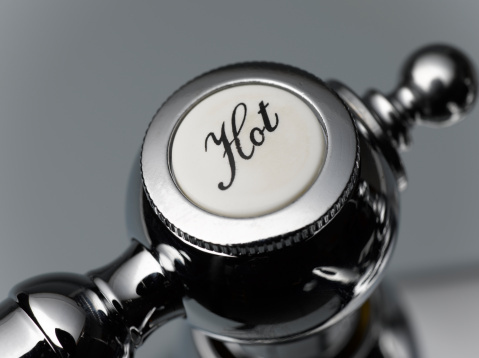 It is no fun receiving a sudden blast of scalding hot or freezing cold water while taking a shower. The pressure balancing spool is a mechanism in your shower's faucet or valve cartridge that adjusts water pressure accordingly to maintain a comfortable water temperature. This is especially helpful for scald-control in nursing homes, hospitals or residences with young children. Without a balancing spool, shower temperatures can fluctuate suddenly without warning. If another toilet in your home is flushed while you are taking a shower, your home's plumbing water pressure will likely drop. The pressure drop happens on one side of the piping system, which disrupts the balance between the hot and cold water supply. The balancing spool in the shower faucet manages the hot-to-cold water ratio, and allocates hot and cold water to each side of the piping system when pressure fluctuates. As a result, you avoid getting hit with freezing or scalding hot water whenever another supply line is in use. Balancing spools are available in a variety of forms and models. However, the most common form contains a perforated cylinder with a perforated internal slide. This slide moves from one side to the other and realigns the spool's perforations whenever water pressure drops. Pressure is decreased on the high-pressure side until the water pressure equalizes inside the shower valve. To keep your pressure balancing spool in working condition, clean the balancing spool regularly. Spool-type balancing valves are susceptible to clogging from debris, scale deposits and sediment build-up. Large particles can get stuck in the balancing spool, preventing water from running properly through the faucet. The "Ultimate Guide to Home Repair & Improvement" suggests removing the faucet handle, escutcheon and faucet body to remove sediment. Gently tap the spool on a hard surface to loosen debris, and rinse out with water. If the internal slide still does not easily slide back and forth, replace the spool. Shower balancing spools are installed either from the front side or back side of the plumbing shower wall. Installing balancing spools from the back side is the most cost-effective method, since repairs can be made without taking apart the wall. However, if access to the back side of the shower wall is blocked, you must repair the cartridge faucet from the front side. To enable easy access to the balancing spool, install access doors in the drywall or plasterboard in case of future maintenance.